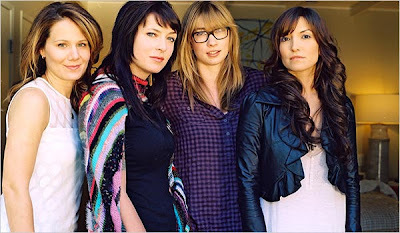 The New York Times has a nice article about Diablo Cody and her three screenwriter BFFs (Dana Fox, Liz Meriwether and Lorene Scafaria) on how they're joining forces to create a "fempire" - a group of females intent on supporting each other in their creative endeavors. "You can find them at work in their Laurel Canyon homes in their pajamas, or sitting next to one another at laptop-friendly restaurants. To see them gathered amid the dinosaur topiary around Ms. Fox’s swimming pool with their dogs (they all have dogs) is to see four distinct styles of glamour that bear little resemblance to traditional images of behind-the-scenes talent. Whenever one of them has a movie opening, they all rent a white limousine and go from theater to theater to watch the first audiences react." That's beyond cool! I wish heard more stories like this. Are you part of a fempire? thanks! !you have a really nice blog too! youve done a lot of good work!